So what's Spiral? I don't remember reading about that. Westminster Dog Show started last night, concludes tonight. As usual, I failed to pick a single group winner. It's been around since 2005, IMDB says. Probably the only way we'll get to see it is if somebody makes an American version, yuck. Rita -- same with me; I've never picked a group winner, much less a Best in Show. 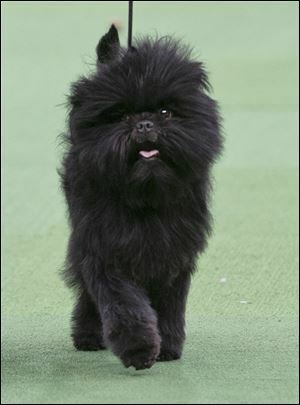 This year's winner...Banana Joe, an Affenpinscher. He really does have two eyes, you know. Multibreed dog shows aren't popularity contests. Once Best in Breed has been chosen for each breed, then it becomes merely a matter of how the judges feel about each entrant. How can one really say, "this Affenpinscher is a better Affenpinscer than that Old English Sheepdog is an Old English Sheepdog?" Minor factoid: I understand that working Old English Sheepdogs commonly are shorn so they don't have to put up with all that hair. Minor factoid: I understand that working Old English Sheepdogs commonly were shorn each year with the sheep, so they didn't have to put up with all that hair all summer. Another minor factoid: Some are botn tailless, but some with short tails, which was amputated. It is now illegal throughout Europe to dock dog's tails. I don't know how these two items can be reconciled. The new Survivor...I suppose it was too much to hope for three good games in a row. Why do those people even listen to that pretentious, self-important Phillip? And in a Fans and Favorites game, how did Francesca qualify as a favorite when she was the first one voted off in her first game? Who remembers her? Most likely she's the producers' favorite, not the audience's. A sacrificial lamb, someone tossed in to give Phillip a chance to show his true colors. I don't much cotton to this fans vs. favorites competition; I'd rather see all new players. One exception, I'm glad to see Cochran again. He's not only amiable, he's the most intelligent one on the show, and that includes Jeff Probst. But intelligence isn't highly valued in this game; Andrea was almost voted off "because she's smart." Generated in 0.531 seconds in which 0.295 seconds were spent on a total of 14 queries. Zlib compression disabled.